Geneva, 27 June 2011 – Parties to a global treaty supporting information exchange in international trade of hazardous chemicals have acted to strengthen protection of human health and the environment by expanding the exchange of critical safety information between exporting and importing States. Agreement was reached on Friday, 24 June 2011, at the conclusion of a week-long meeting held in Geneva. 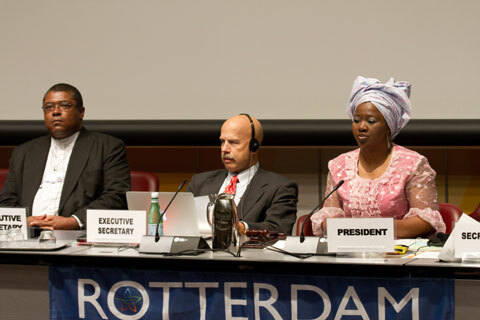 The fifth meeting of the Conference of the Parties to the Rotterdam Convention on the Prior Informed Consent Procedure for Certain Hazardous Chemicals and Pesticides in International Trade agreed by consensus to add three pesticides, alachlor, aldicarb and endosulfan, to Annex III of the Convention. Listing in Annex III triggers an exchange of information between Parties and helps countries make informed decisions about future import and use of the chemicals. “The agreement on listing endosulfan coupled with decisions to strengthen technical assistance and synergies taken by the Parties to the Rotterdam Convention demonstrate that increasing cooperation between the Basel, Rotterdam and Stockholm conventions is yielding a rich harvest of benefits to countries by the protection of public health and the environment globally,” said Achim Steiner, UN Under-Secretary General and UNEP Executive Director. Parties to the Stockholm Convention on Persistent Organic Pollutants agreed earlier this year to eliminate endosulfan from production and use globally. The decisions to list three chemicals were among 12 separate decisions adopted at the conference aimed at strengthening the globe’s first line of defence for chemical safety. Amendments to the Convention bringing the three new chemicals under the Prior Informed Consent procedure will enter into force on 24 October 2011. This will raise the number of chemicals covered under the Convention to forty-three. “The addition of these three chemicals marks the second time since the Convention entered into force that Parties have expanded the Convention’s list of substances covered by the Prior Informed Consent procedure. This gives countries that are considering importing hazardous chemicals the right-to-know about the risks they carry and how they can protect public health and the environment, as well as the means to protect against unwanted imports,” said Jim Willis, Executive Secretary. The conference agreed to include endosulfan as a pesticide in Annex III to the Convention as recommended by the Chemical Review Committee, a scientific expert body, at its second and sixth meetings. This marked a breakthrough, as past conferences had been unable to agree on inclusion of the pesticide in Annex III. Countries will now be provided with risk information allowing them to make informed decisions on importation of the hazardous chemical. The pesticides alachlor and aldicarb were recommended by the Chemical Review Committee at its fourth meeting. Agreement to list a fourth chemical, chrysotile asbestos, eluded the conference for the third time since it was first recommended for listing by the treaty’s Chemical Review Committee in 2002. Debate over the recommended listing of chrysotile asbestos drew widespread public attention throughout a week of sometimes tense negotiations between the Convention’s parties. Over 500 participants, representing more than 135 governmental, intergovernmental and non-governmental organizations attended the fifth meeting of Conference of the Parties to the Rotterdam Convention. The meeting was held from 20 to 24 June 2011, in Geneva. The fifth meeting of the Conference of the Parties to the Rotterdam Convention met under the theme “Rotterdam COP5: PICturing Chemical Safety, PICturing Informed Decisions”. The Rotterdam Convention entered into force in 2004. It built on the voluntary Prior Informed Consent, or PIC, procedure, initiated by UNEP and FAO in 1989, which gave way to the formalities of the Convention. The Rotterdam Convention was adopted in 1998 and entered into force in 2004 and makes the PIC procedure legally binding. One-hundred forty-one countries are currently Parties to the Convention. Morocco and Russian Federation have deposited instruments of ratification and will become the 142nd and 143rd parties in July 2011. Endosulfan has been used for over 50 years to effectively control several pests such as chewing, sucking and boring insects. Due to its severe adverse effects on health and environment, it is banned in at least 60 countries including the European Union, Australia and New Zealand, as well as Asian and West African nations. However it is still used in many other countries on commercially important crops, such as coffee and tea. Chrysotile (serpentine forms of asbestos) was proposed to be included in the PIC procedure as an industrial chemical. Its proposed listing at the conference was based on the final regulatory actions to ban or severely restrict its use due to its impacts on health as notified by Australia, Chile and the European Community.